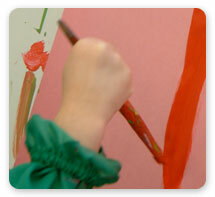 Sunnylea offers age-appropriate programs for two and three year olds. The three year old program is offered three mornings a week with a maximum capacity of 16 children. The class has two teachers and one parent on duty for the duration of the class. Note: teachers will begin to get children ready for dismissal 10 minutes before end of class. Must be 3 years old on December 31st of the enrollment year. In addition to our standard nursery program, SCNS is excited to offer two extension classes for three year olds to help your child prepare for kindergarten and spark a love of learning. The Enrichment Class focuses on letters, numbers, and writing skills laying an important foundation for literacy and numeracy. This structured learning environment helps further prepare your child for kindergarten. Staring new in September 2017, an exciting program of experimentation and learning as children explore themes of music, science, visual arts, dramatic movement, and engineering. Spark your child’s curiosity and creativity through hands on learning opportunities as we experiment, construct, move, and sing. Each week will feature a new topic for your child to explore in one of our core themes. The capacity for the two year old program is 15 children, offering a morning class twice a week. Always 3 teachers and 1 parent / caregiver in each class. Must be 2 years old on December 31st of enrollment year. Download our Parent Handbook (PDF – last updated August 2017) HERE. The main philosophy of the Sunnylea Cooperative Nursery School is learning and socializing through play. 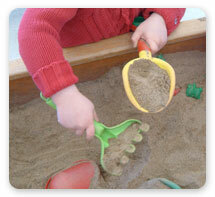 The playroom is well-equipped, offering numerous choices for playing/learning activities. There are many opportunities for learning within the Sunnylea program through weekly themes and routine daily activities. The children become very comfortable with the familiar daily program that includes free play (both indoors and outdoors), snack time and circle time. The school also hosts special events throughout the year where the child’s family is invited to participate, such as a Christmas Party, Halloween Party, pumpkin hunt, Easter egg hunt, Mother’s Day tea, Father’s Day Open House, Easter Egg Hunt, etc. Each day’s structure encourages the children to familiarize themselves with the school setting providing free play, table work to develop their fine motor skills and imagination, snack time and circle time. The weekly theme is incorporated into the daily program. We have a library in the classroom and the toys and books are changed every week in accordance with the theme. Our school also encourages a gentle approach to separation anxiety for the child and caregiver. We understand that the first school setting may be intimidating for a child and we allow parents to stay as long a necessary during the first part of the year to alleviate the child’s anxiety. The parent/caregiver will work closely with the teachers to facilitate a gentle separation. Each day begins with a welcome from the teachers at the door and free play for the children. During free play the children are encouraged to become involved in one of the areas of the playroom. The children can engage in dramatic play with dress-up costumes and other imaginative play in the home centre consisting of a fully stocked toy kitchen. Dinosaurs, a sand table, paint easels, a water table, trucks, building blocks and a workbench are available for more imaginative play. There is a drawing table for picture drawing, letter drawing, scribbling and invented spelling. Other quiet play activities include puzzles, books and games. Weather-permitting the children occasionally start the day outdoors, where they have outdoor free play. Tidy-up time follows free play. 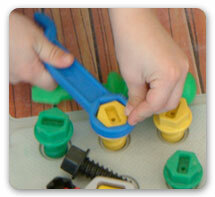 The children are encouraged to assist with tidying up of the toys in preparation for snack time. A nutritious snack is provided by the duty parent, while the duty child takes pride in assisting and handing out the snack to his/her friends. Following snack, the children participate quietly in reading books in anticipation of circle time. During circle time the children participate in discussions regarding the theme for the week, the daily calendar and letter and number recognition. The children also learn and sing songs as well as hear a story during this time. Learn more about our teachers and what makes us special, how to register for Sunnylea Co-Op, read answers to Frequently Asked Questions, or see how to find us in Etobicoke.